More than one third of college freshmen have at least one mental health disorder, a new report reveals. Stress levels are sky-rocketing among every age group, and students adjusting to their first year of college may be particularly vulnerable. Schools have taken steps to meet the psychological needs of their student body, but a far smaller fraction of the students utilize on-campus counseling services. But that hasn’t curbed rising rates of mental health disorders among students around the world, according to the new Columbia University study. The rates of mental health disorders among this class of freshmen were 72 percent higher than the one-fifth of college students of all ages who filled out the survey two years ago. Certain life events and stages are inevitably accompanied by higher stress levels, and in 1967, two psychiatrists even created a scale assigning a stress score to a number of common major occurrences. Beginning or ending school causes only a fraction of that stress, with a score of 26, but it still makes the list of major events. Starting college may not be as inherently stressful, but the Columbia University study authors point out that this change also comes at a point of much greater instability. Fully-fledged adults tend to have long-standing jobs and relationships, while incoming students are in a stage of self-focus, exploration and general uncertainty. These are all ‘normative’ for what the study authors call ’emerging adults,’ but instability also poses a particular threat to the needs and care of those with mental health issues. And there are many students that wind up in these precarious positions. Now, 35 percent of college freshmen have at least one mental health disorder, and a primary concern for the study authors is that these young adults might stop seeking or following through on treatment plans. In fact, other studies have found that just 15 to 20 percent of college students seek out campus counseling services, the authors point out – though, other recent research of American college students has put that number closer to 30 percent. This study assessed the mental health of 14,000 students at 19 colleges in Australia, Belgium, Germany, Mexico, Northern Ireland, South Africa, Spain and the US through surveys. Of the 35 percent with one or more mental health disorder, depression was the most common condition, followed by anxiety. ‘The finding that one-third of students from multiple countries screened positive for at least one of six mental health disorders represents a key global mental health issue,’ said lead study author Dr Randy Auerbach. 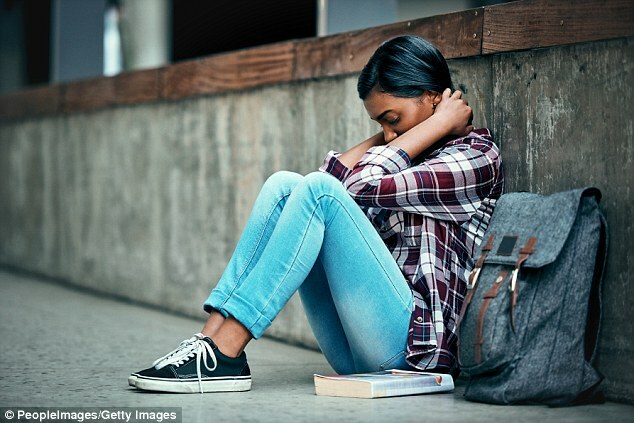 Earlier this week, another US study found that more college students (of all ages) have suicidal thoughts than ever, a worrying trend that suggests many students are in pain, and falling through the cracks of schools’ care. ‘While effective care is important, the number of students who need treatment for these disorders far exceeds the resources of most counseling centers, resulting in a substantial unmet need for mental health treatment among college students,’ Dr Auerbach said. He posits that ‘internet-based tools’ may offer some help to the overflow of students in need, or those still dissuaded from help by stigma and fear of judgement. ‘It is incumbent on us to think of innovative ways to reduce stigma and increase access to tools that may help students better manage stress,’ both to ensure their individual health and to ensure that Dr Auerbach said.